← How to convert PCL to bitmap and fit to paper size? If you don’t have any Adobe product or the latest MS Office Word on your computer, yet want to convert PXL to PDF and fit to paper size, you can try VeryPDF PCL Converter. VeryPDF PCL Converter contains a GUI application and a command line application, both of which are good solutions. 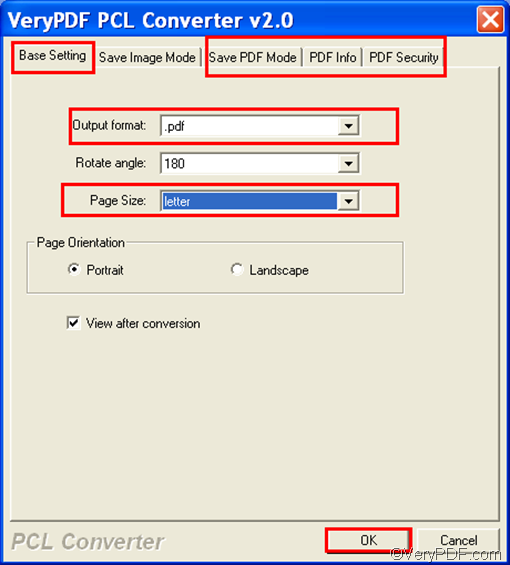 This article focuses on the GUI application and explains how to take four steps to convert PXL to PDF and fit to paper size. Please download VeryPDF PCL Converter and install it on your computer. Then, double click its icon on the desktop to run VeryPDF PCL Converter. The following illustrates the interface. To input separate PXL files, please drag the selected PXL from Windows Explorer and drop them into the list box. Then, you can view the selected PXL files in the list box. To input a directory, please click File on the toolbar, > click Add Directory, > select a folder in the pop-up dialog box, > press Enter. Then, all the PXL files in that directory will be shown in the list box. Click Setting under the list box, then you can find the setting dialog box as follows on your computer screen. Five tabs are at the top of the dialog box. The first one is for basic output setting and last three ones are for PDF setting. Under the default tab Base Setting, the default output format is PDF, so you are only required to select a proper item form the Page Size combo box. For example, you can choose letter in the Page Size combo box. If you don’t want to set other options, please click OK to go back to the main interface. Otherwise, please click other options and tabs before you click OK. For example, if you want to set a PDF user password, please do as follows: click PDF Security, > click the check box preceding Encrypt PDF File, > type the password in the User Password edit box. > click OK.
To output PDF files, you need to select a folder before you start the conversion task. Please do as follows: click Start on the interface, > select a folder to export the result PDF files, > click OK to start the conversion. When the process is finished, the computer will automatically open the PDF files for you. This is how you can use the GUI application of VeryPDF PCL Converter to convert PXL to PDF and fit to paper size. Do you think VeryPDF PCL Converter is easy to use? If you want to purchase it, please click Register on the interface. How to convert PRN to bitmap and fit to paper size? How to convert PRN to JPG and fit to paper size? How to convert PRN to PostScript and fit to paper size? How to convert PRN to PXL and fit to paper size? How to convert PRN to BMP and fit to paper size? Do EMF files contain EMBEDDED FONT CHARACTERS? This entry was posted in VeryPDF Blog and tagged fit to paper size, pxl to pdf. Bookmark the permalink.